Fans of Blackadder will recall the episode where, on the same night, Edmund has to hold a piss-up in one room of his house, and stress his puritanical credentials to his aunt and uncle in another room. There was something of that in Prime Minister’s Questions today, as the Tories sounded like a bunch of yobs on the sauce, and Mr Corbyn sounded like Lady Whiteadder chastising with the phrase “wicked child”. The issue was, as one would expect, tax credits. Jeremy wanted to know whether the Prime Minister could guarantee today that no-one would be worse off next year under the revised proposals. The Prime Minister responded that the honourable gentleman (note the lack of “right” in that title) would have to wait for the Autumn Statement. The PM sat down to the tune of some braying from his rowdy supporters, before Jez hit back by asking the simple yes or no question again. The PM responded with the same answer, and sat down to the tune of some more braying. The pisshead-impressionists hollered at the perfectly calm Leader of the Opposition, who looked as though he was growing into his role in much the same way as his tie is growing into his collar. He stood for ten seconds waiting for the Tories to shut their gobs. He asked the question again, and the same uncommitted response came forth. Jez asked the question a fourth time, and a female Labour MP shouted “Answer the question!” That really got the lads going, with some hooting and ooing. Honestly, their repertoire of noises is so bestial that it could be used by a sound editor on a David Attenborough programme. This time, David Flashman thought it that a taunt of his own was in order. Citing the activity of the Lords earlier this week, he declared that there was a new alliance between “the unelected and the unelectable”. The party behind him loved that, roaring “More! More!”; clearly unaware that they sounded like a repellent rugby society. Corbyn tried a different tactic, citing Michael Gove’s statement in the election that tax credits would not be raised. At this point, the thought occurred that the PM was reluctant to answer questions because the answer he gave on this very issue in the election edition of Question Time had come back to haunt him so. 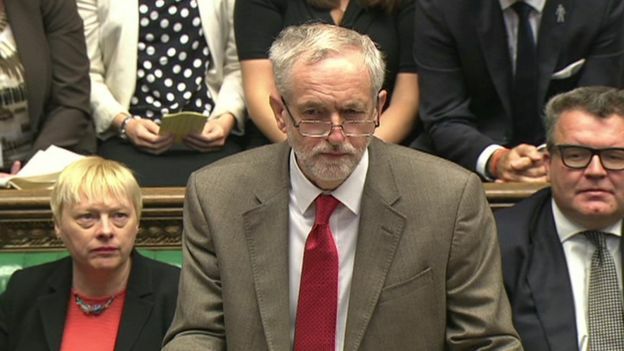 In his answer, where he evaded the question once again, he had the temerity to tell Mr Corbyn to “get off the fence”. Against a wall of growling, Jez tried one last time to get an answer, this time with a question from Karen. At which point, Conservative MPs snorted their derision. “It might be very amusing to members opposite, but I was sent this question by Karen” said Jeremy. And it turned out that Karen works full-time at the living wage. She would lose hundreds of pounds. Comedy gold, you will agree. “I ask him for a sixth time,” sighed Corbyn, and for the sixth time answer came there none. The New North by North Westminster Podcast is available here.